We danced together, though not with one another. Bobby was mellow and the band followed his lead. We all did. It tends to happen when you’ve spent more time playing guitar and singing on stage than anyone else alive. More people than can be counted have danced down in the dirt in front of him, the way all of us danced together now, the dust gathering around as bare feet and sandals kicked to the drum beat with the thrum of swaying bodies rising and falling like the melodies. The band was tight. Surely Bob Weir could have whatever musicians around him he wanted, and yet this group wasn’t a cast of allstars. They were just average looking guys playing the standard riffs, with average intensity jams throughout the Dead songs. But there was magic in it. It was in the slow tempo Bob chose for us that night, the last night of the festival. It was in the relatively low volume, especially compared to Panic who played the night before at a volume twice as loud as necessary, per usual. The magic crept through Bob and made the white hair from his chin to head wave like the spanish moss in the oaks behind him. We could all feel it. The stardust had contrived in bringing us to the sandy dance floor where earlier that day JJ Grey had said the truth, “every moment of your life has brought you to this moment.” It was life and it was happening. And even though we all had tangents we would take after the weekend, we had something infinite in that moment, a nation of love that would stay with us. There are no outsiders at Wanee because it’s a gathering of outsiders. It’s here that you can see a war vet with a cane and an underage dreadlocked girl dancing together, singing the same lyrics and feeling just as glad as the other. Looking around, the place seems to be filled with thousands of different people who have never met or may think they have nothing in common. But look there. Those strangers just stopped to hug each other and now there are five of them all holding together smiling and closing their eyes. It’s something you can’t believe is authentic until you’ve seen it happen five times and the sixth time you find yourself included. There’s no fear in that embrace. The hill leading away from the biggest stage, The Peach Stage, is dotted with little parties. There are circles of frisbee throwers and colorful blankets laid beneath couples. There are two little girls, neither over the age of five, dancing with the long haired man who is showing them how a person dances who is in love. They watch for their parents’ approval for a while but then seem to abandon it so they might better emulate the stomps and kicks and be in love like the man. Next to them lies a young man who stares at the ferris wheel across the way, his eyes large and relaxed and his hands resting behind his head. There’s a large leather hat resting on his chest and dirty feet are crossed below him. He’s watching the night sky. Over the hill of vendors who sell everything from artist merchandise to Nepalese rings and fairground foods, the Mushroom Stage is a-rockin’ just as hard. It’s down in a bowl with a significantly smaller footprint and dance floor. Live oaks are spread across the natural amphitheatre and dozens of hammocks are spread between them. 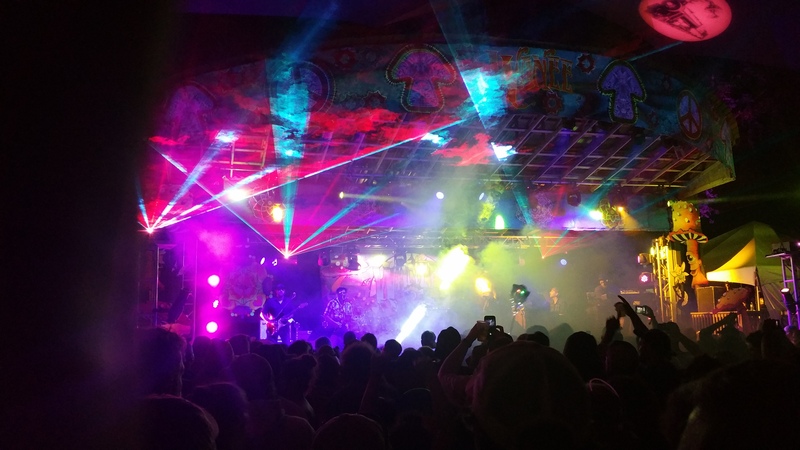 The music can be experienced in different ways, and that’s one thing that makes Wanee so beautiful. It’s intimate at this stage. The dancing is just as prevalent if not more so, and it’s the perfect spot for the late night show where from midnight to two a.m. Les Bres will play the Allman Brothers’ music they’ve been playing since they were the Allman Brothers, and where the next night Pink Talking Fu will play the Bowie and Prince songs that are so good they almost make you cry. But it’s late when they play and everyone has been dancing for four days now and it’s the final hour so if anyone cries it’s from joy or because Wanee 2017 has ended, but either way they’re good tears, the kind you might remember when you’re old. Maybe when I’m old I’ll be back here. Most of the trees will probably still be standing in forty years and I hope I can still dance this way when that time comes. I see barefooted old men sliding through the silt and look at my own. They began aching Friday from either the sunburn or the amount of time spend on them, and standing barefoot helps. My sandals are clipped to my bag and when I bend over to stretch my back they flop down on my head and I wonder how many more times it’ll happen before I remember they’re there. I look back at the old men who now have joined arms and are spinning in circles, and I see that one of them has sandals clipped on his bag and they are flopping around as he jumps with youthful joy. I smile. Perhaps he has the same kind of energy that Dr. John has. I watched him lead the entire musical arrangement from behind the piano in 90 degree temperatures with a gusto not seen in many 76 year olds. And when the show was over it took him almost a full minute to get completely offstage and he needed help from a cane. Where had the energy of the performance come from? I see a man later, one who certainly watched The Dead back when they played Haight-Ashbury, dressed in tie dye overalls and shirt, skipping along the path singing to everyone he passed. Each lyric was directed at a stranger who must’ve been beautiful in his eyes. At set break he leans on a walker. I watch the handicapped section by the Mushroom stage and see a man in leg braces who boogies hard enough that I worry about the structural integrity of his supports. A woman in a wheelchair raises her front wheels off the ground and screams for, “more Steely Dan!” Kung Fu indulges and I am suddenly overwhelmed with gratitude as I run closer to the stage to hear Kid Charlemange in all its integrity. And so later on I’m dancing next to this girl with her long colorful braids that may or may not be real but she swings them like she owns them so I love them. I feel like maybe she’s looked at me but I can’t be sure because my mind isn’t something I trust at the moment, and soon I don’t care because Bobby and the band are playing Jack Straw and that’s something I do trust. I think of a dear friend not with me and the lyrics, “we can share the women, we can share the wine,” bring tears to my tightly closed eyes, behind which the music plays in patterns. There’s been four or five of us in this same spot for both sets and I’ve watched them all as best I could. The dancing is real. It’s not for anybody to see and I feel a little guilty for watching but they inspire me. The young guy next to me moves so slowly I wonder if he hears the same music as me, but when I watch closely I see there is movement I didn’t see before, and that he’s performing a greatly detailed dance. The man in front of him has bounced to a beat faster than the one playing but as I fall into his rhythm I realize he’s dancing to all the music, even the silence between the sounds. There’s a large, grey-haired man next to him who has his head tilted back and is watching the stars. I can’t help but watch them too, and I feel a kinship with him and I sing lyrics to him and maybe he hears or maybe he doesn’t. I close my eyes again and we all sing “no our love will not fade away,” until Bob and the band fade to nothing and it’s just 20,000 voices and pairs of hands clapping, the band watching and listening. Then Bobby is strumming and it’s Ripple, the last song of the set. It’s sweet now and we’re lifted outside of ourselves. Hands reach up and people touch, and we all lah-dah-dah the final verse, something everyone can do. The energy is in us all and people who normally might frown are laughing and people who aren’t dancers have abandoned those ideas. Music has changed us all, the way it does Dr. John and the man with the walker. The air is thick with smiles and gladness. The large, old man has tears in his eyes and even though his sandals are on his feet I know where he is and who he is because I feel the same tears in my eyes and because I know that the stars dance with us, approving of our tiny movements that are celestial in comparison to something else, all of us just stardust being kicked into life by the music.